Alright I recently enjoyed the pleasure and the bounty(!) of another new homeschooling book. Recall I extolled that other one - What Really Matters - for *attempting to bridge the gap* between the vital *why* and the *how to* homeschooling questions. Well, if that book was the bridge, Laura Grace Weldon's Free Range Learning is, the destination - THE how-to manifesto! 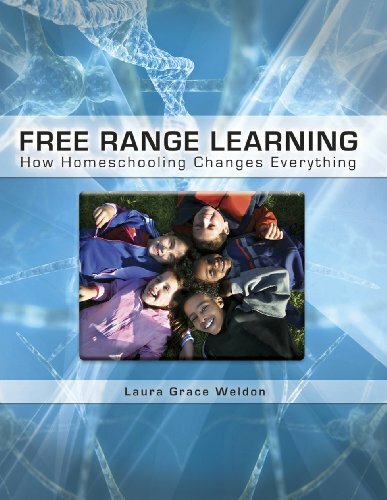 Sure, Free Range Learning covers the obligatory issues like: socialization, the differing homeschool philosophies, etc. but the book's real power is its resourcefulness. Weldon's nearly 300 page book (large pages too!) is just teeming with practical suggestions for parents. From texts, curricula, organizations, and websites right down to countless, simple ideas on how a didactically-inclined parent might steer a day's activities. This comprehensive book is EXACTLY what my wife and I need as we enter the intermediate stage of homeschooling - just beyond literacy and numeracy. As my long-time readers well know, I generally prefer the eggs of genetically modified, corn-fattened, chickens whose legs can barely support them in those jam-packed cages. HOWEVER, as this crunchy farm girl convincingly articulates, homeschooling is in fact THE infinitely natural, bio-organic(!) path for treading on this Gaia-forsaken planet. ...That's because adults tend to be future oriented. We're distracted from the present moment by the need to plan and work toward any number of goals - what to do about dinner, how to juggle next month's schedule, when we can get some bills paid off. These distractions take our attention away from what is in the here and now. When we think ahead so often, we have less time to notice, let alone appreciate, what makes up our lives minute by minute. What is impatience except denying the value of the present moment? The watercolor effect of rain on the window, the meandering quality of a child's conversation, the long wait for a pot to boil - these can be occasions to experience or opportunities to breathe deeply and experience gratitude. Leaning so often toward the future unconsciously demonstrates to our children that later is more important than now. Yet, as we know, later never comes. As long as we're alive there's always "later" to strive toward. Worse, we are surrounded by media-driven messages telling us that we aren't there yet, that we need to do more or become something more in order to have friends, be successful, find love. The nature of early childhood is the perfect antidote to this hurry-up attitude; that is, if adults truly pay attention to the lessons the youngest model for us. Young children who are not yet pulled by the adult world's messages are oriented to the present moment. When forced to disregard what is vital to their bodies and spirits - pretending, daydreaming and playing - they rebel. They are who they are, where they are. They are not caught up in the future tense which diminishes the here and now. Homeschooling can be a solution to our cultural overdrive. Homeschooling days provide ample opportunities for a mix of multisensory activities that anchor us to the moment. Practicing a new piece on the guitar, forming a juggling troupe with friends, birdwatching, reading on the couch, volunteering at the Head Start center down the street, growing heritage vegetables, competing in a robotics tournament, putting out a zine - homeschoolers can engage the creative energies they choose. Providing children with a range of opportunities while leaving plenty of space for relaxation allows each family member to find his or her balance. It gives us the time to know one another as whole human beings. There's no need to make homeschooling into a daily hustle of events. Some well-intentioned parents overload their children with so many lessons, field trips, sports and clubs that everyone feels tense. Admittedly there are more enticing prospects for children's activities than ever before. But what is learned here is larger. We show our children by example that we know how to savor life. Each day is a microcosm of the lessons we teach them about our values and priorities. Throughout most of history, childhood was entirely different. Children provided significant help to their families, and otherwise they were left to their own devices. This left them with ample time to reflect, imagine, play and understand themselves in relation to the world around them. The Slow Movement is part of a cultural shift toward reconnecting with a simpler way of life, such as locally grown food, slower-paced work and closer relationships. Savoring rather than rushing. Homeschooling makes up part of this trend. We are taking back time with our families, and choosing to spend that time in ways that are personally meaningful to us. I just want to reiterate that the strength of this book is that it's a genuine font of ideas - a book that won't be simply read, tucked into a bookshelf and/or passed on. My wife and I will no doubt be consulting Free Range Learning with biblical regularity - in the development of our educational website, on rainy days, and in the course of our homeschool macro-planning. In fact, if I myself were sufficiently qualified and intent on writing a *homeschooling* book this is precisely the template I would choose - a little bit of theory backed up with copious real world homeschooling examples. Laura offers up not only her own experience in homeschooling four kids, she also shares the wisdom and testimony of a hundred homeschooling families in this book (the real meat of this text). You see, homeschooling remains an extremely difficult concept for newbies to wrap their brains around. Because at root, to the parents it represents a complete repudiation of the system that produced and defines them to this day. Few among us are capable AND willing to look in the mirror and admit personal shortcomings - no less set out to address the causes. After all, the system never taught us to judge ourselves - only certified, unionized experts were permitted to do that! And, additional to the self-assessment hurdle, homeschooling has to overcome the *imagination* problem. Present-tensers innocent of history are powerless to conceive of another way of raising their children - one different not only from how they grew up, but also at odds with what their neighbors are doing. I hate to say it, but even a color TV show or motion picture depicting a homeschooling family might go a long ways towards de-mystifying the lifestyle. In the meantime, everyone with the slightest concern about their kids' education, particularly those on the fence about *pulling their kids out*, would do well to take a look at this one. Another Piece In The Bad Back Puzzle? Racist Caption in Boston Globe? Can't Wait To Do Something Like This! Only Way To Beat The Asian Female Golfers! Wall Street 2 - Better Than The Original! Can You Spot The Homeschooled Kid? Eminem - A Class Act! No Way This Is Real! Muchas Cervezas O Mucho Trabajo? Hoist On One's Own Petard! Living With The MIL Chronicles 3 - Over Already?